More old items keep being revealed, and as these plushes show, new ones keep being made. 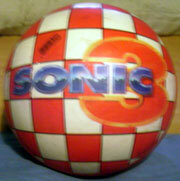 Here is a simple ball featuring Sonic 3 theme. This is a medium-size smooth-surface ball often called a "Play Ball" which is made of semi-soft rubber and is full of air. It can be used in outdoor games and is fairly bouncy. Despite being a rather simple item, it has good design and is colorful. Sonic is giving the "3" fingers on the front, while Knuckles is jumping in looking rather irritated. They're both in front of a large 3, which has bolts for details. The back, curiously enough is checkered much like the special stage which takes place on the surface of a large sphere! That portion of the design is actually rather clever. The logo on the back is also in fine form, looking stylish and shiny. 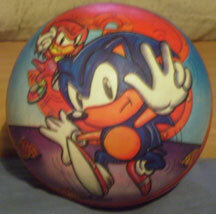 This ball is from 1994, and there should exist another, with a different design. This is a large cardboard standee made for Sonic Adventure DX. It also has a dot on it that apparently is announcing a free ringtone as a bonus of some sort. All of Sonic is there (though he is covered by items in this photo) and it is rather large, standing at least 4 feet high. 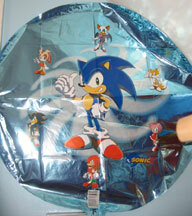 Here's a party balloon featuring the cast of Sonic X. This colorful collectible piece is the UK (and possibly rest of EU too) counterpart to the Sonic 10th Anniversary Collectors Box. It has the same things inside as the USA box did, (coin, booklet, cd) but the exterior here is more of a montage/collage thing with most of the people from Sonic Adventure 2 Battle in it. Here, it's called Birthday Pack, and was (as expected) available for 2 days only (noted at the bottom) If you want to see the USA version, along with what was inside, it is USA Sonic 10th Anniversary Pack. Photo of this one by: Rhia. An interesting combination item to celebrate the release of Sonic Heroes to the UK. This is a post card with a twist. Each of the charachters are stickers and can be peeled off and used. 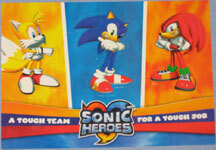 It says "A tough team for a tough job" with everyone from 'team Sonic' on it. 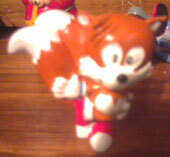 If you get right up close to this, Tails looks irritable, rather than tough, though. The stickers are nice and glossy, so this seems like a good quality card. Photo by Rhia. 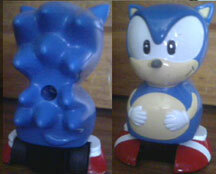 Here are some old PVC Sonic figures from the UK. It is likely some of these were from a box set. The tails is especially old, and not particularly on-model. It should be noted that the face/chest fur which should be white has discolored with time, which is usual for this figure. With "Talking Sonic's" box in the background, you can get an idea of the sizes. What's that to the far right? 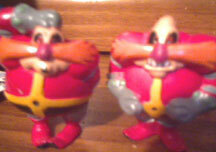 It's a badly broken Eggman from one of the sets. The Shadow of course, is much newer than anything else in the photo. 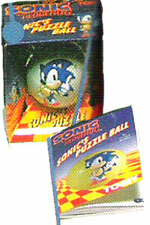 Here's "Sonic's Puzzle Ball". It's rather like a Rubiks Cube, but instead of colors, you're turning it to make the Sonic image. Two of these were released in the USA, this one is UK. Tomy made it in 1994, and it came with a manual, and fit into its interesting cube box. It's described as being 'from all major toy shops' but it was 6.99 pound, making it somewhat pricy for a plastic ball you turn. Photo credit: Ricky Lee. Here's a Sonic sipper bottle. These large plastic lidded bottles are great for sports. With a cap for the straw, bees can't go inside either. This one just has running Sonic on a black background. The other side is likely to have a logo on it. This is uncommon. 1994 at BHS stores and 2.99 pound. Supposedly there is also a Tails theme one. Photo credit: Ricky Lee. 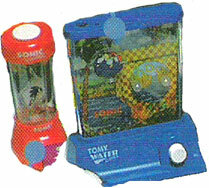 Here are two water mini games. These are plastic games that you fill up with water via a hole in the top. You can then push a button on the front to create currents in the water that move plastic rings around. The objective is to catch the rings on little hooks or spikes inside the game. (see what they did before video games were quite so popular?) On the more complex one, Sonic may spin! These are from 1994, in any toy shop, and are around 4.99 pound (likely for the larger one) Photo credit- Ricky Lee. Here is an old, uncommon Sonic electronic game. 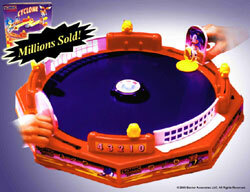 The original game was called "Bop Bop N Rebop" by Hasbro 1979-1998 which was in the USA. 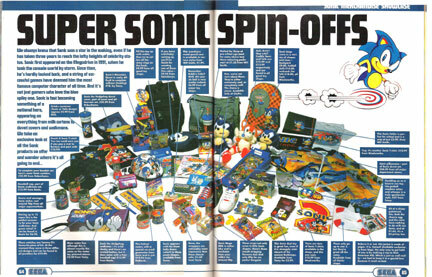 Later, in 1993, Tomy Toys UK got a hold of it, and the Sonic license and turned it into "Sonic Cyclone" seen here. The original BBNR game sold over 1 million in the USA (non-Sonic theme) hence the claim. It was then sold in the UK and EU for 3 years. The objective is to slide the yellow plastic disk across the spinning middle (blue area) to try and get it into the 'goal' (non fenced area) of the opponent to get a point and move the counter (yellow thing) to a number. The base has stickers showing Sonic running, Robotnick running, the Sonic logo, and rings. 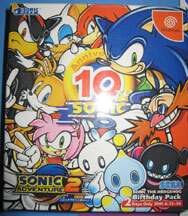 This standee was used in stores to announce/promote Sonic Chronicles. It's pretty large and features die-cut edges. You can see parts of Amy Rose and Tails are coming right off the edges of the main rectangle, for an interesting look. The standee resembles the box art to the game. The bottom white part just has the copyright info and who made it. This is photographed and owned by TheIron Hedgehog. This set of 3 vinyl classic style Sonic figures is from www.play.com . They were made by First4Figures & more detail can be seen on Display Figures They are available starting Oct. 30, 2009. Each figure is 2 inches high and does not move. They resemble the PVCs of the 90s, so if you weren't able to get any of those, these could do well for you. It's also interesting that each character is portrayed in quite a static front-facing position, with arms at the sides--very plain which makes it unusual among figures, they'll stand out. Each one will be 3.99Pound (about 7 dollars!) which is a bit on the pricey side per-each for static figures. These are prizes for the Mario & Sonic Winter Olympics contest. 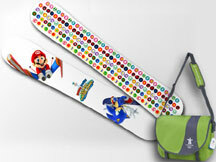 Sega Europe is giving away special display snowboards and messenger-style bags to promote the release of the game. The USA had a similar contest, however its prizes were generic (a bag, a TV, neither of which had anything to do with the game itself) The snowboard has Mario skiing, the logo, and Sonic on a snowboard. The other side features many of the colorful icons from the game. In this instance, the bag is generic, and not Sonic-related. It is a separate runner-up prize. Photo by Sega, discovered by Taaron.